I’m the proud owner of a 2009 Mac Pro, which I’ve owned since 2010. I’ve owned this Mac longer than any other prior Mac which might explain why Apple does not make Macs that are easily upgradable any longer; they get fewer sales of new hardware. As cool as the (not-so-new) 2013 Mac Pro is, it is still too expensive and not upgradable enough for my purposes. As a software developer, I prefer to have lots of storage and do not need dual video cards. So I’m sticking with my classic Mac Pro (or Mac Pro tower) for the time being. 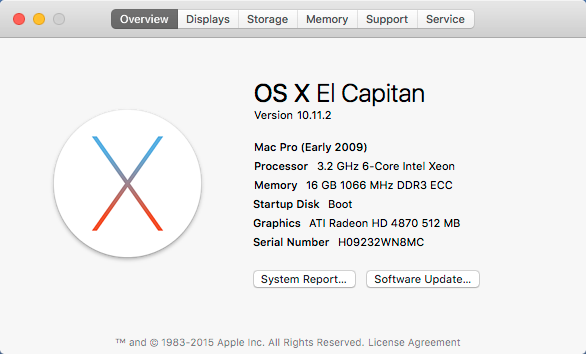 My Mac Pro is a single-CPU, quad-core 2.93Ghz model (Intel Xeon W3540) with the ATI Radeon HD 4870 video card. Over the years I’ve upgraded it with several SSDs and to 16GB RAM. 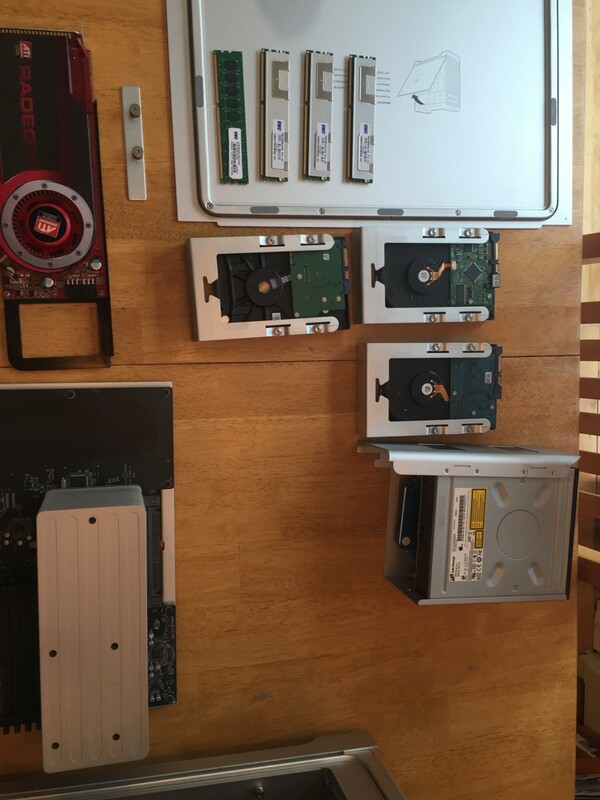 Adding drives to this Mac Pro is super easy. I have one SSD in the 2nd optical drive slot and another mounted on a PCI card (the OWC Mercury Accelsior S). Plus I have other large spinning hard drives for archival purposes in the standard drive bays. Overall, there is space for four 3.5" (or 2.5" drives with adapters) in the drive bays. Add the 2nd optical drive slot, plus 3 empty PCI card slots and this Mac Pro can hold a total of 8 drives, all of which are inside the case! As awesome as the storage management is, this thing is not nearly as fast as the latest Mac Pro or even the latest iMacs. It also doesn’t have Thunderbolt or even USB 3. USB 3 can easily be solved with a $60 PCI card to add four superspeed ports. I don’t have a big need for USB3 just yet since I can keep so many drives inside the Mac Pro, but it’s nice to know this low-cost option is available. There is nothing that can be done about Thunderbolt, however. 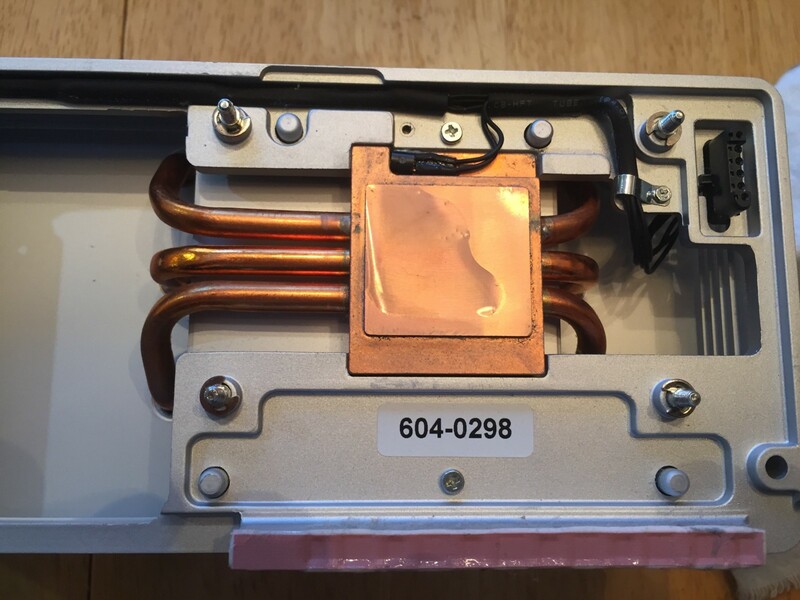 I had recalled reading in the past that the Mac Pro CPU might also be upgradeable, but I had never looked into it before. It didn’t take much searching to find out that even a CPU upgrade is pretty easy to do! It is also possible to upgrade my single-CPU system to a dual-CPU configuration, but that requires an all-new daughter board, which greatly increased the cost enough to make it impractical. But updating the single CPU definitely seemed like an option. After some initial CPU research I had considered getting an Intel Xeon W3580 3.33 Ghz quad-core (Nehalem), which would be about a 14% speed improvement. These CPUs seemed to be going for about $120 or so, making it a worthwhile upgrade cost. I was about to purchase the W3580 when I discovered with a little more digging that the 2009 Mac Pro (MacPro 4,1) is essentially the same as the 2010 and 2012 model Mac Pros (MacPro 5,1). The only difference is those newer models have a newer firmware that supports even better processors and allows for sound over DisplayPort to HDMI (not relevant to me). After doing these steps my Mac Pro showed as a MacPro 5,1 model, which meant it could now support better CPUs such as the 6-core Westmere CPUs. Now we’re talking! With the firmware updated, I started looking around at other CPUs and found the Intel Xeon W3670 3.2Ghz 6-core for about $120 at Star Micro. This is a little slower clock speed than the W3580, but I’d get two extra cores. It’s also a Westmere 32nm CPU rather than an older Nehalem 45nm CPU. I find that extra cores are valuable with the multiple VMs that I often have running in my job as the Xojo Developer Evangelist and I was sure they would prove useful with Handbrake and encoding audio and video for podcasts, videos and webinars. A 3mm, 9" long hex wrench to remove the Mac Pro heat sink on the CPU. Artic Silver 5 Thermal compound and cleaner for cleaning and attaching the CPU to the heat sink. You’ll probably want some compressed air as well. After everything arrived, I was ready to do the upgrade. Before I started, I noted the current CPU temps using iStat Menus. I also ran GeekBench 3 (all numbers are for the 64-bit tests) to note its current speed ratings. Power down the Mac Pro and unplug everything. Open the case and slide out the CPU daughter card. While I had the case open I decided to remove all the parts to clean out as much dust as possible. I removed the graphics card, the optical drive bay and all the drives. 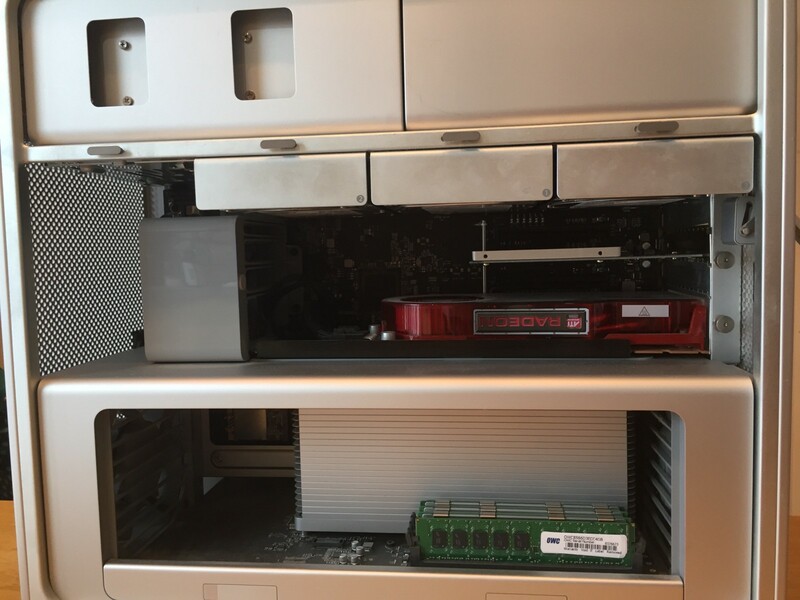 I then used compressed air to clean as much dust as possible from the inside of the Mac Pro (especially any fans). The heat sink in particular had lots of dust in it, as did the back side of the daughterboard. Once I was happy with the dust removal, I used the hex wrench to remove the heat sink. I loosened the 5 screws in a criss-cross pattern. The screws are self-retained and do not actually come out so you don’t have to worry about losing them. 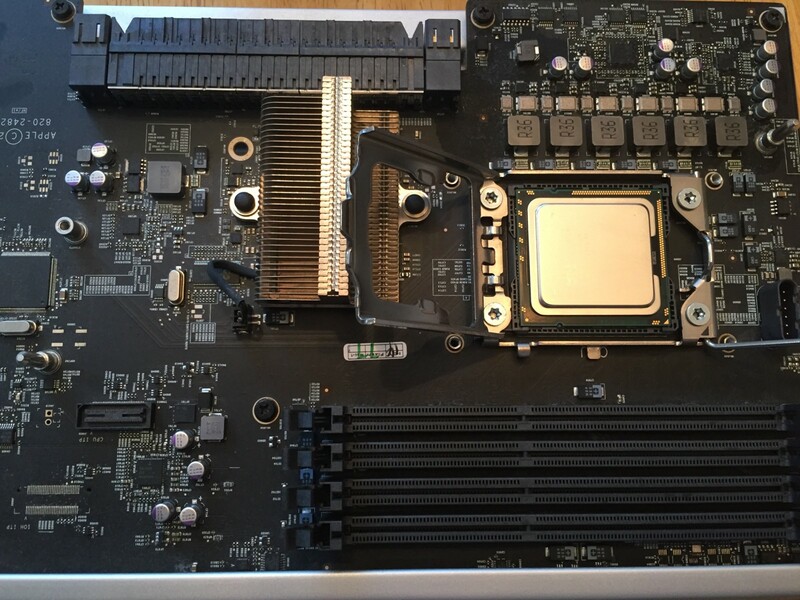 I carefully lifted the heat sink off the daughter board. I then removed the old CPU from the daughter board by pushing the latch and then raising it to release the CPU cover lock. Then I opened the cover and the CPU lifted right out. I set it aside. 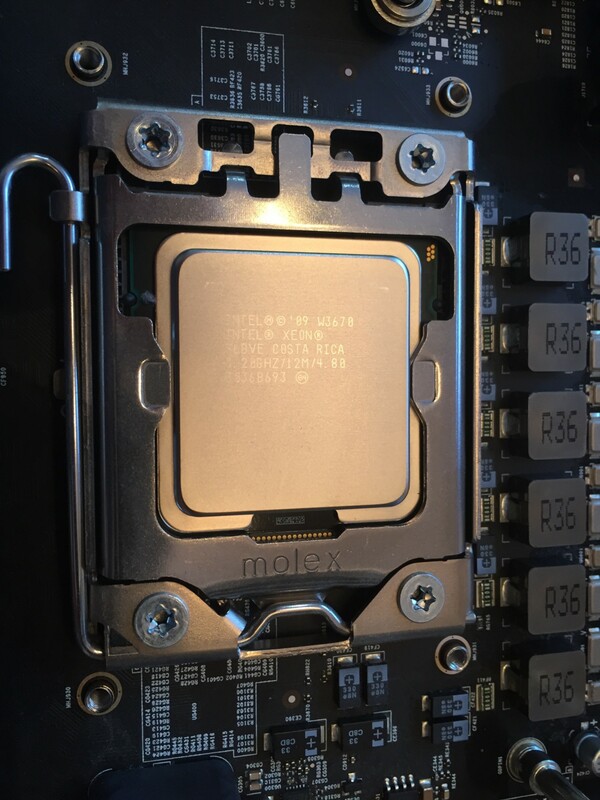 I took the new W3670 CPU and placed in in the CPU socket (it only fits one way, with the slots lined up), closed the cover and then lowered and locked the latch into place. The bottom of the heat sink had residual thermal paste which I then needed to completely remove. I used the removal liquid from the kit and thoroughly cleaned the bottom using a lint-free cloth. Then I used the cleaning liquid from the kit and polished the bottom. With the heat sink all clean, I added a small (pea-sized) blob of thermal paste to the center of the CPU in the daughterboard. I did not spread the paste as most of my research seemed to suggest that it is best to just let it get spread by the heat sink when it is attached. I replaced the heat sink and tightened the screws, again in a criss-cross pattern until they were snug. Do not over tighten! I put the daughter-board back into the Mac Pro. I put all the other components back into the Mac Pro. I hooked everything back up, crossed my fingers and turned the power on. I got the single chime and it booted to the login screen! Hooray! Then I checked the CPU idle temp after the computer settled down and it was running about 94 degrees F. This is about 25 degrees cooler than before. The fan noise, not that it is loud to begin with, was much less noticable. I then ran Geekbench 3 and got these results: 2590 single-core; 14542 multi-core. Temps peaked at about 130 degrees F.
That’s an improvement of about 15% in single-core and 65% in multi-core with lower overall operating temperatures! Lastly, I encoded Mad Max Fury Road again. This time the CPU reached a maximum of about 179F and it took about 14 minutes for it to finish, a 10 minute savings. This all looked good so the next step was to do a burn-in, which I did using the Geekbench “stress test” option in the menu. I chose the 24-hour “burn-in” option. For that the temps were stable at about 170 degrees F.
I am more than pleased with these numbers. For a total outlay of about $130 this was well worth the time (about 45 minutes or so). Single-core scores remain much lower than recent Mac models, but the multi-core scores are now competitive. It seems like the W3680/X5680 would likely be the next best bang for your buck option at about $100 more than the W3670 with 5% faster single-core and 9% faster multi-core. Remaining possible updates to my Mac Pro include: A newer 480GB SSD ($150–200), a USB 3 PCI card ($60), 32GB RAM ($200), a Blu-ray drive ($66) and possibly an updated video card with 1GB RAM ($375+). But none of those are urgent. If I wanted to get the best SSD speed possible, an Accelsior E2 (or other PCI-based SSD) is much faster, but expensive. I’ve seen used Mac Pro towers available for under $1000, so if you can find a good deal for one somewhere, and like tinkering on hardware it might be worth picking one up. But even though I really like this Mac Pro, when the time comes for it to be replaced, I suspect I’ll have to choose an iMac. A nicely spec’d 27" retina iMac with a 4.0Ghz i7 (quad-core) and a 3TB Fusion drive is about $2650 plus another $200 for 32GB OWC RAM. This is a lot of money, but you do get a fast computer and a top-notch display. Related: Read how I added 4K support to my Mac Pro. Play: I am a father, husband, baseball player and technology geek. Work: Developer Evangelist for Xojo and Owner of LogicalVue Software.